Coinage of the Ptolemaic Kingdom was in use during the last dynasty of Egypt and, briefly, during Roman rule of Egypt. Ptolemaic coinage was struck in Phoenician weight, also known as Ptolemaic weight (about 14,20 grams). This standard, which was not used elsewhere in the Hellenistic world, was smaller than the dominant Attic weight. Consequentially, Ptolemaic coins are smaller than other Hellenistic coinage. In terms of art, the coins, which were made of silver, followed the example set by contemporary Greek currencies, with dynastic figures being typically portrayed. The Ptolemaic coin making process often resulted in a central depression, similar to what can be found on Seleucid coinage. The Ptolemaic dynasty introduced coinage to Egypt, where pre-existing native dynasties did not use coins. 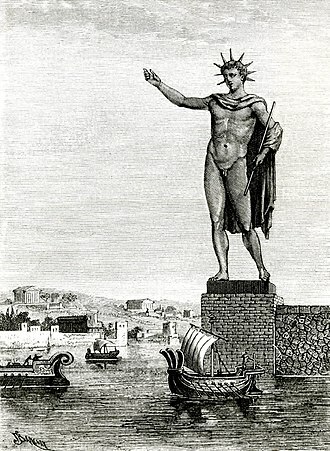 The first Ptolemaic mint was in Memphis and was later moved to Alexandria. 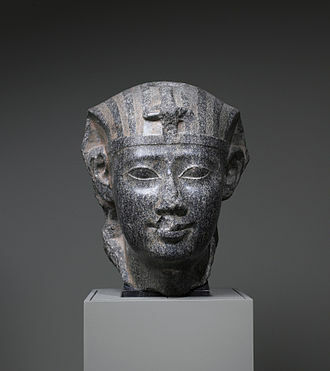 Succeeding in monetizing the Egyptian society, largely due to efforts of king Ptolemy II Philadelphus, the Ptolemaic kingdom flourished. For most of its history, the kingdom vigorously enforced a policy of a single currency, confiscating foreign coins found on its territory and forcing its dominions to adopt Ptolemaic coinage. 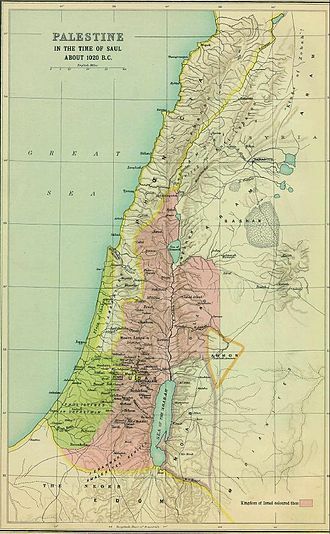 In the rare cases when these dominions were allowed their own currency, such as the Jewish community in Palestine, they still had to observe the Ptolemaic weight. These policies, along with inflation and increasing difficulty to obtain silver, caused monetary isolation of the Ptolemaic coinage. After Egypt was annexed into the Roman Empire and the Ptolemaic dynasty ceased to exist, its currency still remained in circulation. This was the case until the rule of Emperor Nero. Silver from the coins was reused for Roman tetradrachm. Denarii and aurei did not circulate in the former Ptolemaic Kingdom, so Egypt's monetary isolation continued. Ptolemy V Epiphanes' bronze coin. Depression in center of the coin can be clearly seen both on obverse and reverse sides. Reverse shows a common Ptolemaic symbol, the eagle standing on a thunderbolt. 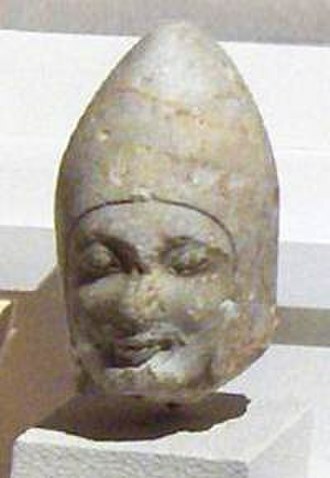 Ptolemaic Kingdom used Phoenician weight instead of the more common Attic weight. Phoenician weight, also known as Ptolemaic weight, is about 14,20 grams. The more common Attic weight from other Hellenistic states is approximately 17,26 grams. Ptolemaic coinage was struck in different standard, and the kingdom sought to obtain full royal control on coinage in circulation. The largest denominations of Ptolemaic bronze coinage weight up to 100 grams. Artistically, Ptolemaic coinage closely followed contemporary Greek currencies. A commonplace symbol of the Ptolemaic dynasty is an eagle standing on a thunderbolt, first adopted by Ptolemy I Soter. The more peculiar Ptolemaic coinage include so-called "dynastic issues". 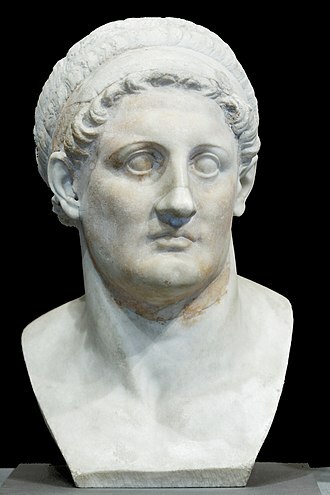 Ptolemy II Philadelphus married his sister Arsinoe II, possibly to gain legitimacy in eyes of the local Egyptian population. 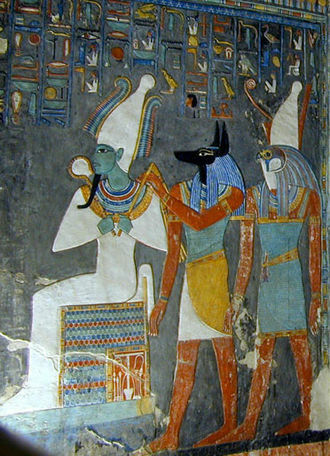 Egyptian rulers had traditionally married their sisters to signify a connection to sacred union between the deities Osiris and Isis. A medal-like coin with one side portraying Ptolemy II and Arsinoe II, and the other side portraying Ptolemy I and Berenice I was struck after the death of Arsinoe II. 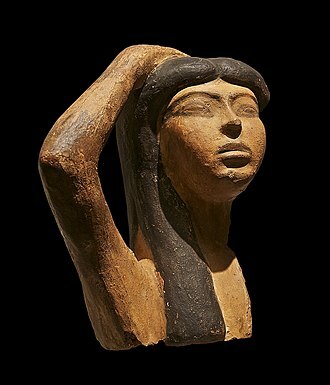 She had significant posthumous influence on Egyptian religious life, and the ruling Greek dynasty was deified. In the coin making process, there were similarities with Seleucid coinage. For instance, Ptolemaic coins often have a central depression from the coin making process. 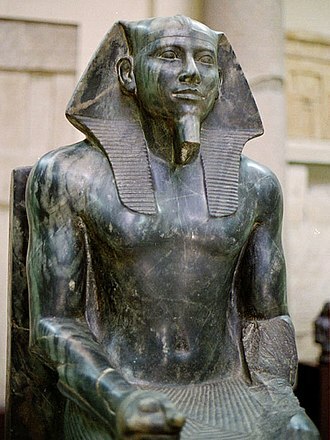 The first Ptolemaic mint was at Memphis. It was later moved to Alexandria. Tyre was the most important coastal city out of the five Ptolemaic cities with a mint in Syria. 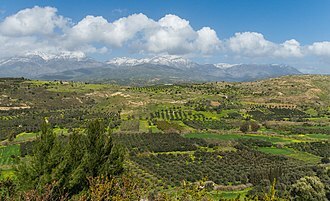 After the Seleucid Kingdom led by Antiochus III the Great conquered Coele-Syria Ptolemais in Phoenicia (Acre) was still allowed to strike coins using the Phoenician weight. The mint remained very prolific, and was among the most active ones in the Seleucid Kingdom. It is likely that the city struck silver coinage without an interruption after it changed hands, as it was a very important city in Phoenicia. However, the Seleucids discontinued a Ptolemaic mint in Jaffa. In Greece, Ptolemaic coinage mainly originate from Peloponnese and Euboea. Corinth did not strike Ptolemaic coinage during its brief subordination to the kingdom. Cyprus had many important mints, and the island struck large amounts of Ptolemaic coinage from 200 BC to 80 BC. Cyprus was also richer in silver than Egypt. In the second century BC, most of the Cypriot coinage are easily identifiable and datable because they include abbreviations for mints and dates for both gold and silver coinage. Cypriot mints from this period include Salamis (abbr. ΣA), Kition (abbr. KI) and Paphos (abbr. Π, and later as ΠA). Meanwhile, at Crete, there was no royal coinage in use, and Cretan cities had a strong autonomy of minting their own coins. There are no evidence that Ptolemaic mints existed in Asia Minor. Furthermore, regions such as Cilicia and Lycia had no autonomous mints striking local currency. It seems that there was little circulation of Ptolemaic currency in Caria, Lycia, Pamphylia and Cilicia. Local Pamphylian silver coinage was discontinued under Ptolemaic control. It is likely that people in southern Asia Minor simply did not have a habit of using coinage in everyday economic transactions. Silver was scarcer than gold in Egypt, and the exact ratio of their value is unclear. Silver was however probably shipped in significant quantities from abroad. In addition, Ptolemaic Cyprus produced some silver for coinage struck locally. Coinage was not used in Egypt during pre-Ptolemaic native dynasties. It has been deducted from discoveries of ancient foreign coinage in Egypt that foreign currency was used as bullion rather than as money during the native dynasties. 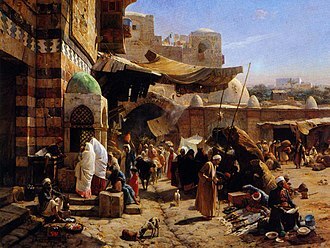 During Ptolemaic rule, Egypt transformed from a widely currency-free society to a largely monetized one by the course of the third century BC. 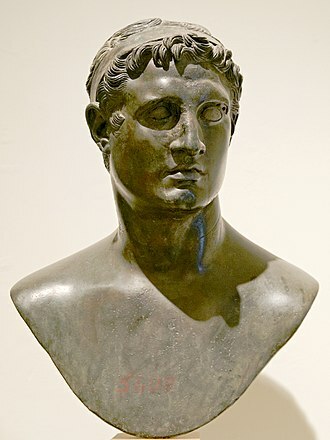 King Ptolemy II Philadelphus had a marked influence in the process. 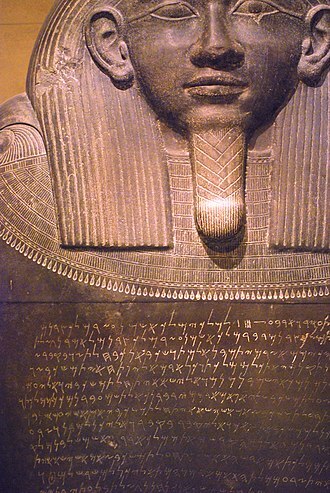 Greek rule monetized Egyptian taxation, and this was one of the key reasons for the success of the Ptolemaic state. 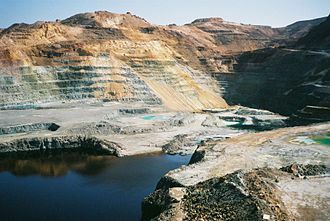 Before the Ptolemaic period, metals such as copper, and grain, were used as mediums of exchange. Ptolemaic rule brought, in addition to the coinage, banks and tax farming to the country. 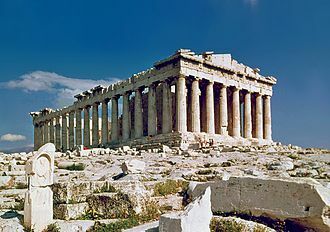 However, even centuries earlier, increasing trade with Greece seemingly had strengthened the process of monetization. 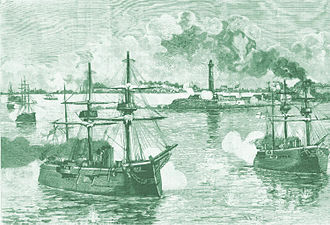 Founding of the Greek trading colony of Naukratis had coincided with the strengthening trade relations. 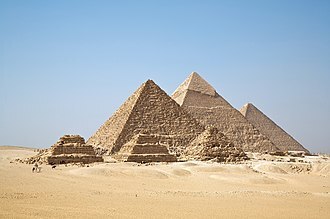 The Ptolemaic Kingdom did not use the Attic weight, or Attic standard, which was very common in other contemporary Hellenistic states such as the Seleucid Kingdom. Instead, the Ptolemaic Kingdom used Phoenician weight, which was smaller than the Attic weight. Consequently Ptolemaic coinage was smaller than coins used by other Hellenistic states. The kingdom also briefly utilized Rhodian standard in the transition process to the Phoenician weight. A possible reason for this very brief usage of the Rhodian weight in coinage may have resulted from strong commercial ties with the island of Rhodes. However, it is important to note that the Rhodian standard was lighter than Attic but heavier than Phoenician weight. As a result, the process shows a clear downward scale in size of the coinage. Despite this coincidence, political reasons and trade partnerships are still offering better explanations than a proposed theory that value of silver was in appreciation during Ptolemy I's reign. During most of the Ptolemaic Kingdom's history, it was a policy that all foreign coinage within Egypt would be confiscated by the state and replaced with Ptolemaic currency. Parallels between Athens and the Ptolemaic Kingdom can be drawn as Athens attempted to introduce a sole currency in its empire. The Ptolemaic Kingdom forced its own monetary system to its foreign dominions. In rare cases, where cities under Ptolemaic dominion were allowed to keep their local currency, the cities were still forced to convert their currency to Phoenician weight. One such instance was the Jewish community in Palestine, as they were allowed to mint coins with the names of their magistrates. 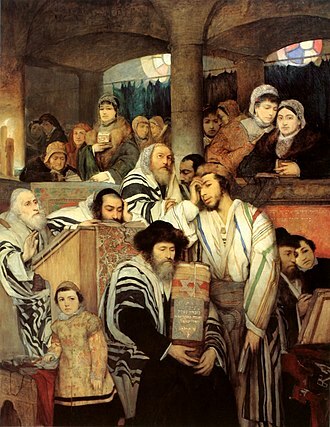 However, the local Jewish currency effectively disappeared by the third century. In comparison, neighboring Seleucid Kingdom's policy was less strict in imposing the royal control on mints. 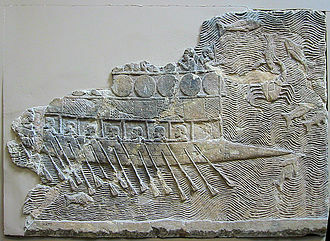 Cleopatra VII. 51–30 BC, 40 drachms, minted at Alexandria; obverse: diademed bust of Cleopatra VII. Reverse: inscription reading "ΒΑΣΙΛΙΣΣΗΣ ΚΛΕΟΠΑΤΡΑΣ", with an eagle standing on thunderbolt. During the reign of Ptolemy I Soter, the founder of the kingdom, diverse local currencies were allowed to exist. They may even have been encouraged. The exact date of elimination of non-Ptolemaic coinage varies by region. As early as during Ptolemy I's reign, the closed nature of Ptolemaic monetary system started to form. 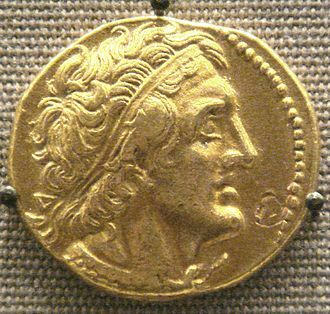 In Egypt and Syria, Ptolemy I discontinued local coinage, which had Alexander the Great's image struck in them, after feeling secure in power. Such coinage with Alexander on them were very common in the successor states of the Macedonian Empire. Cypriot coinage was eliminated when the local monarchies ceased to exist. 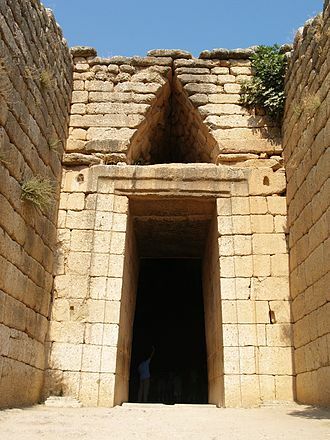 In Cyrene it took even longer to eliminate municipal coinage. In Crete the local currency was never suppressed. 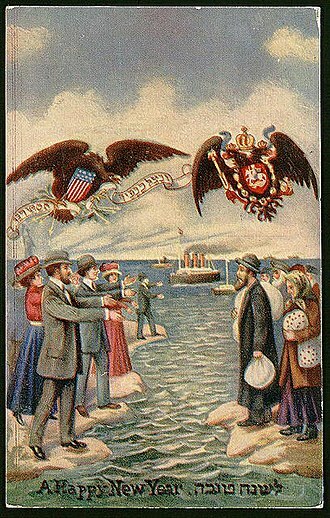 Uniformity of the currency was sought flexibly, yet opportunistically. As it became increasingly difficult to obtain silver for the Ptolemaic kingdom, bronze coinage largely replaced silver in Egypt. Furthermore, monetary isolation was increased by other factors, like considerable inflation and the use of a unique standard to replace the Attic weight. Early Ptolemaic silver coinage was struck from pure silver, but by the time of Cleopatra VII it had suffered a very large degree of debasement. Despite of the economic difficulties in the Ptolemaic realm, economically notable debasement began in 136 BC. After Cleopatra VII's economic reform in 51 BC a type of stater that was only one third silver was issued. After the demise of the Ptolemaic Kingdom, and annexation into the growing Roman Empire, silver coinage struck by the Ptolemies still continued to circulate. The Ptolemaic silver coinage mostly disappeared by the time of Emperor Nero. It is assumed that by that time, in the first half of the first century, the Ptolemaic silver coinage was probably recycled into a new currency, Roman tetradrachms, struck at mints managed by the Romans. Roman Egypt remained monetarily as a closed system, like it had been under Ptolemaic dynasty. 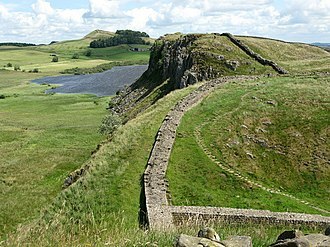 Roman denarii and aurei did not circulate in provincial Egypt. ^ Otto Mørkholm (31 May 1991). Early Hellenistic Coinage from the Accession of Alexander to the Peace of Apamaea (336-188 BC). Cambridge University Press. p. 8. ISBN 978-0-521-39504-5. ^ a b c d e f g h i j k l m n Roger S. Bagnall (1976). The Administration of the Ptolomaic Possessions Outside Egypt: With 3 Maps. Brill Archive. pp. 176–202. ISBN 90-04-04490-6. ^ a b c d e f William David Davies; Louis Finkelstein (16 February 1984). The Cambridge History of Judaism: Volume 1, Introduction: The Persian Period. Cambridge University Press. pp. 29–31. ISBN 978-0-521-21880-1. ^ Fulinska, Agnieszka. "Iconography of the Ptolemaic queens on coins: Greek style, Egyptian ideas?". Retrieved 22 December 2017. ^ Otto Mørkholm (31 May 1991). Early Hellenistic Coinage from the Accession of Alexander to the Peace of Apamaea (336-188 BC). Cambridge University Press. p. 13. ISBN 978-0-521-39504-5. ^ George MacDonald (22 March 2012). The Evolution of Coinage. Cambridge University Press. pp. 68–69. ISBN 978-1-107-60599-2. ^ Getzel M. Cohen (1995). The Hellenistic Settlements in Europe, the Islands, and Asia Minor. University of California Press. p. 129. ISBN 978-0-520-08329-5. ^ a b Christopher Howgego (11 September 2002). Ancient History from Coins. Routledge. pp. 38–39. ISBN 978-1-134-87783-6. ^ a b Newell, Edward T. "The first Seleucid coinage of Tyre". Digital Library Numis (DLN). pp. 1–2. Retrieved 22 December 2017. ^ a b c Peter Watson (16 October 2014). A Brief Introduction to Egyptian Coins and Currency. AuthorHouse. p. 17. ISBN 978-1-4969-9020-4. ^ "The Coinage of the Ptolemies in Cyprus". kyprioscharacter.eie.gr. Retrieved 22 December 2017. ^ a b Milne, J. G. (22 December 2017). "Ptolemaic Coinage in Egypt". The Journal of Egyptian Archaeology. 15 (3/4): 150–153. doi:10.2307/3854105. JSTOR 3854105. ^ JG Manning (December 2006). "Coinage as 'code' in Ptolemaic Egypt" (PDF). Stanford University. Retrieved 22 December 2017. ^ George Hill (23 September 2010). A History of Cyprus. Cambridge University Press. p. 180. ISBN 978-1-108-02062-6. ^ a b John Pentland Mahaffy (6 November 2014). The Empire of the Ptolemies. Cambridge University Press. p. 488. ISBN 978-1-108-07865-8. ^ Hazzard, R.A.; Brown, I.D. (27 May 1984). "The silver standard of the Ptolemaic coinage". Revue numismatique. 6 (26): 231–239. doi:10.3406/numi.1984.1865. Retrieved 27 May 2018. ^ Kevin Butcher; Matthew Ponting (2 April 2015). The Metallurgy of Roman Silver Coinage: From the Reform of Nero to the Reform of Trajan. Cambridge University Press. p. 609. ISBN 978-1-316-06089-6. Lorber, Catharine (2018). Coins of the Ptolemaic Empire I: Ptolemy I through Ptolemy IV. New York: American Numismatic Society. ISBN 9780897223560. Faucher, Thomas; Meadows, Andrew; Lorber, Catharine (2017). Egyptian hoards I:The Ptolemies. 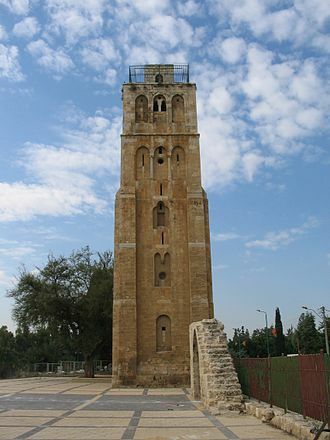 Institut français d'archéologie orientale du Caire. ISBN 9782724706895. Wikimedia Commons has media related to Coins of Ptolemaic Egypt. Paphos /ˈpæfɒs/ is a coastal city in the southwest of Cyprus and the capital of Paphos District. 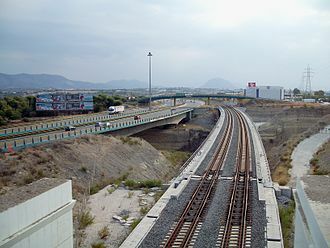 In antiquity, two locations were called Paphos, Old Paphos and New Paphos, the currently inhabited city, New Paphos, lies on the Mediterranean coast, about 50 km west of Limassol, which has an A6 highway connection. Paphos International Airport is the countrys second-largest airport, in Greco-Roman times, Paphos was the islands capital, and it is well known for the remains of the Roman governors palace, where extensive, fine mosaics are a major tourist attraction. Paul the Apostle visited the town during the first century AD, the town of Paphos is included in the official UNESCO list of cultural and natural treasures of the worlds heritage. Paphos enjoys a climate, with the mildest temperatures on the island. Paphos has been selected as a European Capital of Culture for 2017, the author of Bibliotheke, the Hellenistic encyclopedia of myth long attributed to Apollodorus, gives the genealogy. Pygmalion was so devoted to the cult of Aphrodite that he removed the statue to his palace, the daimon of the goddess entered into the statue, and the living Galatea bore Pygmalion a son, and a daughter, Metharme. Cinyras, perhaps the son of Paphus, but perhaps the successful suitor of Metharme, founded the city under the patronage of Aphrodite, according to another legend preserved by Strabo, whose text, varies, it was founded by the Amazons. 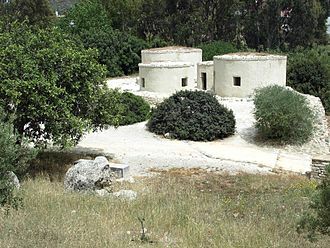 Archaeologists report that the site of Old or Upper Paphos has been inhabited since the Neolithic period and it was a centre of the cult of Aphrodite and of pre-Hellenic fertility deities. Aphrodites mythical birthplace was on island, where her temple was erected by the Myceneans in the 12th century BC. 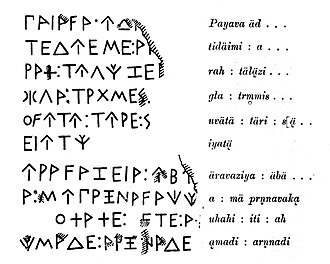 The Greek names of two kings and Akestor, are attested in Cypriot syllabary on objects of seventh century BC found in Kourion. 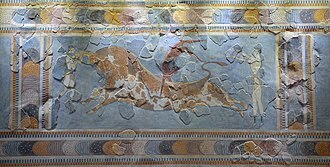 The mosaics of Nea Paphos are among the most beautiful in the world, the port of Paphos was rebuilt by Nicocles, the last king of Paphos, at the time of Alexander III of Macedon. The theatre, located in the area of the ancient city, is dated to approximately the end of the fourth century BC and has been under excavation by the University of Sydney since 1995. Isis is a goddess from the polytheistic pantheon of Egypt. She was first worshiped in ancient Egyptian religion, and her worship spread throughout the Roman Empire, Isis was worshipped as the ideal mother and wife as well as the patroness of nature and magic. She was the friend of slaves, sinners and the downtrodden, Isis is often depicted as the mother of Horus, the falcon-headed deity associated with king and kingship. Isis is known as protector of the dead and goddess of children, as the personification of the throne, she was an important representation of the pharaohs power. The pharaoh was depicted as her child, who sat on the throne she provided. Her cult was popular throughout Egypt, but her most important temples were at Behbeit El Hagar in the Nile delta, beginning in the reign with Nectanebo I, on the island of Philae in Upper Egypt. In the typical form of her myth, Isis was the first daughter of Geb, god of the Earth, and Nut, goddess of the Sky and she married her brother and she conceived Horus with him. Isis was instrumental in the resurrection of Osiris when he was murdered by Set, using her magical skills, she restored his body to life after having gathered the body parts that had been strewn about the earth by Set. This myth became very important during the Greco-Roman period, for example, it was believed that the Nile River flooded every year because of the tears of sorrow which Isis wept for Osiris. Osiriss death and rebirth was relived each year through rituals, the worship of Isis eventually spread throughout the Greco-Roman world, continuing until the suppression of paganism in the Christian era. 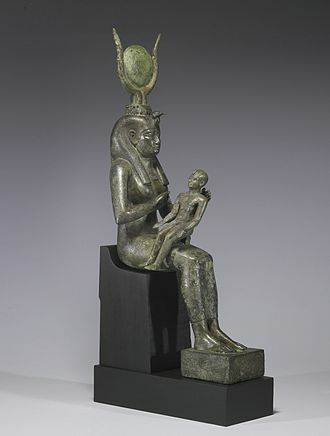 The popular motif of Isis suckling her son Horus, the Greek name version of Isis is close to her original, Egyptian name spelling. Isis name was written with the signs of a throne seat. The grammar and used signs of Isis name never changed during time in any way, the symbolic and metaphoric meaning of Isis name remains unclear. The throne seat sign in her name might point to a role as a goddess of kingship. Antiochus III the Great /ænˈtaɪəkəs/ was a Hellenistic Greek king and the 6th ruler of the Seleucid Empire. 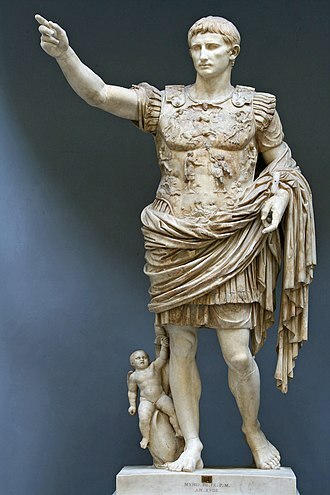 He ruled over the region of Syria and large parts of the rest of western Asia towards the end of the 3rd century BC and his traditional designation, the Great, reflects an epithet he assumed. He assumed the title Basileus Megas, the title of the Persian kings. A militarily active ruler, Antiochus restored much of the territory of the Seleucid Empire, before suffering a setback, towards the end of his reign. He died three years on campaign in the east, Antiochus III was a member of the Hellenistic Greek Seleucid dynasty. He was the son of king Seleucus II Callinicus and Laodice II and was born around 242 BC near Susa in Persia and he may have borne a non-dynastic name, according to a Babylonian chronicle. He succeeded, under the name Antiochus, his brother Seleucus III Ceraunus, upon the murder in Anatolia. Antiochus III inherited a disorganized state, not only had Asia Minor become detached, but the easternmost provinces had broken away, Bactria under the Greek Diodotus of Bactria, and Parthia under the nomad chieftain Arsaces. 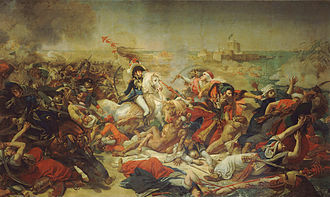 Soon after Antiochuss accession and Persis revolted under their governors, the young king, under the influence of the minister Hermeias, headed an attack on Ptolemaic Syria instead of going in person to face the rebels. The attack against the Ptolemaic empire proved a fiasco, and the generals sent against Molon, only in Asia Minor, where the kings cousin, represented the Seleucid cause, did its prestige recover, driving the Pergamene power back to its earlier limits. 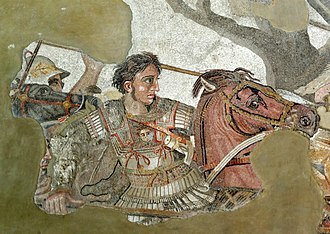 In 221 BC Antiochus at last went east, and the rebellion of Molon, the submission of Lesser Media, which had asserted its independence under Artabazanes, followed. Antiochus rid himself of Hermeias by assassination and returned to Syria, Achaeus himself had revolted and assumed the title of king in Asia Minor. Since, his power was not well grounded to allow an attack on Syria, Antiochus considered that he might leave Achaeus for the present. The campaigns of 219 BC and 218 BC carried the Seleucid armies almost to the confines of Ptolemaic Kingdom and this defeat nullified all Antiochuss successes and compelled him to withdraw north of the Lebanon. Pamphylia was a former region in the south of Asia Minor, between Lycia and Cilicia, extending from the Mediterranean to Mount Taurus. It was bounded on the north by Pisidia and was therefore a country of small extent, having a coast-line of only about 120 km with a breadth of about 50 km. The name Pamphylia comes from the Greek Παμφυλία, itself from πάμφυλος, literally of mingled tribes or races, herodotus derived its etymology from a Dorian tribe, the Pamphyloi, who were said to have colonized the region. The tribe, in turn, was said to be named after Pamphylos, the Pamphylians were a mixture of aboriginal inhabitants, immigrant Cilicians and Greeks who migrated there from Arcadia and Peloponnese in the 12th century BC. But the distinction between the two seems to have established at an early period. A treaty between the Hittite Great King Tudhaliya IV and his vassal, the king of Tarhuntassa, defined the western border at the city Parha. The river is assumed to be the classical Kestros, west of Parha were the Lukka Lands.